Taylor Phinney and those closest to him say he's not just different but much better — as both a person and an athlete. The following feature is a preview of the April issue of VeloNews. It’s 20 degrees and snowing in Boulder, Colorado, which would be reason enough to avoid driving. But it’s also the Sunday of Thanksgiving weekend, which Taylor Phinney — between off-season training camps and team meetings — has managed to spend at home with family. So I text to ask if he’d like to reschedule our interview, or if he’s still okay stopping by the VeloNews offices. I use the extra time to review my questions, which turns out to be pointless. Phinney has already decided what he wants to discuss. This is a good thing, because nothing I planned to ask would have led us to answers as expansive or unexpected as the ones Phinney has been chasing over the past 15 months — a well documented injury rehabilitation during which he took up painting, flying, and, as I’m about to learn, cosmology and metaphysics. He arrives wearing standard-issue hipster: Converse sneakers, a denim jacket over a black hoodie that says “HOCKEY” in white block letters across the chest, and skinny jeans that make his 6 foot 5 inch frame seem even reedier. He asks how I’ve been transitioning into my new job at VeloNews, where I’ve been for only five months. We discuss the media world and cycling journalism. I explain the challenges of not surrendering our love of the sport to the grind of covering it as reporters. “Even that question is such a generic and strange thing to ask someone,” says Phinney, who has a few world championship golds of his own, including one from the team time trial in Richmond. “You felt it, but the thing about it that makes it so special is that you’re never going to feel it again, and it’s almost impossible to describe it. It’s so brief. I immediately want to ask about the 2013 Tirreno-Adriatico, when Phinney rode solo for nearly 100 kilometers in soaking rains, after everyone else in his trailing group had abandoned. He didn’t just come in last place; he spent nearly three hours as the last rider on the road, wet and alone, and then was eliminated after he finished 10 minutes outside the time limit. But go ahead and try to remember who won that day. It was a heroic loss, a last place for the ages. Is that what he means about failure and the learning process? Or is he referring to the disappointment of missing 15 months of his career to an injury from which he will never fully recover? Not since Greg LeMond has an American cyclist turned pro on the back of such a dominant run through the junior ranks. Phinney was clearly never going to be a GC rider. Too big for that. But in his teens, this towering man-child gave every indication that he would be an American Fabian Cancellara, a beast who could own the classics each spring and the time trials throughout the year. Cancellara won two junior and one under-23 world TT championships before turning pro. Phinney’s palmarès includes one of each, plus one junior and two elite track world championships and back-to-back wins in the U23 Paris-Roubaix — all before he turned 20. And his birth certificate carries the names Connie Carpenter-Phinney and Davis Phinney. It was as if, after ignoring tennis for the first 15 years of his life, the son of Andre Agassi and Steffi Graf had picked up a racket, won back-to-back junior Wimbledons, and made the Olympic semifinals. Phinney was also arguably the first American rider — certainly of the modern era — to combine world-beating talent with a genuinely marketable personality. LeMond, among the best ever to ride and definitely a nice person, was a bit awkward. Lance Armstrong was a jerk even when he was on top of the world. George Hincapie never really seemed to break through — in races or in interviews. Andy Hampsten? Too quiet. But even without the royal lineage, Phinney was an unprecedented American talent who was also handsome, funny, personable, and bilingual. (He lived in Italy between the ages of 12 and 15.) He was Cancellara channeling Jens Voigt. For American cycling fans, it felt possible simultaneously to overstate and underestimate the implications. By his own admission, things came too easily for Phinney during his first 20 years, not only athletically but academically. He managed decent grades in school, despite a sworn policy of never bringing any homework home, a rule he and his parents say he stuck to. (The homework got done at school or it didn’t get done.) He figured out how to coast on intelligence instead of effort. But post accident? He just finished reading We Are All Stardust, a series of conversations with 18 of the world’s leading scientists — from fields like astrophysics, neuroscience, and psychology — about not just their work but the nature of curiosity. If Phinney was intelligent enough to get through school with minimal effort, his natural talent as an athlete also let him accomplish more than he should have for the work he had put in. Though he clearly had grown up around cycling, his preferred sport in his earlier years was soccer. The family lore holds that he never even considered bike racing until, at age 15, he accompanied his father to the 2005 Tour de France. Vaughters did sign him, for the TIAA-CREF junior development team, the precursor to today’s Cannondale WorldTour squad. Two years after the Sunflower ride, Phinney won the world junior time trial championships and, in his first race on the track, the elite U.S. national title in the pursuit. He went to the Olympics, collected World Cup track wins like they were stamps, had an entire new development team (Trek-Livestrong) built specifically for him, and tore through the U23 ranks. Nothing in his experience would have led him to expect that the next career step would be any more difficult. “He was probably thinking ‘this is pretty much cake,’” Davis says. It was not. In 2011, his first full year as an elite pro, Phinney managed just two podiums, both in prologues — the Eneco Tour (first place) and the Tour of Romandie (second). 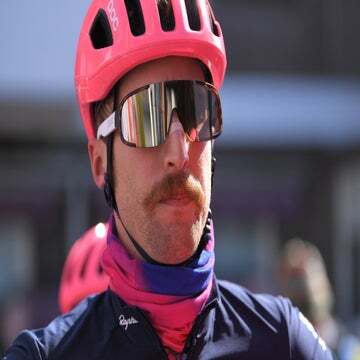 Phinney bounced back in 2012 to finish 15th in his first Paris-Roubaix and then win the opening time trial at the Giro. He wore pink for three days and endeared himself to local fans with his fluent Italian and flamboyant charm. He also claimed time trial wins at the USA Pro Challenge and Giro del Trentino and closed out the year with time trial silver at the elite world championships and agonizingly close calls at the Olympics, where he finished fourth in both the TT and road race. Somehow, despite all the expectations placed on him, Phinney was delivering. The following year he claimed seventh at Milano-Sanremo and earned his first pro win in an open road race, at the Tour of Poland. He won his first stage race overall at the 2014 Dubai Tour; was in the mix at the front end of Paris-Roubaix until he flatted with 15 kilometers to go; and won a stage at the Tour of California. Though he hadn’t yet claimed a victory on par with his talent — and the hype surrounding him — it seemed only a matter of time. Then came the May 2014 U.S. national championships in Chattanooga, Tennessee. Two days after claiming his second national champion’s skinsuit in the time trial — which he planned to debut at his first Tour de France five weeks later — Phinney was leading his friend and UnitedHealthcare pro Lucas Euser down a high-speed descent when a motorcycle appeared in front of them. Euser slid into a wall, destroying his bike. Phinney took a different line and wrapped his left leg around a guardrail. He broke his fibula and tibia, severed his patellar tendon, and sliced through the muscles in his lower leg. He lay on the ground in a crumpled heap, his shattered bones poking through the skin. So the guy who witnessed the crash says it drove him out of the sport. And the guy who suffered it? While he was lying in the hospital after his accident, Phinney felt that he would be able to return to racing before the season was out. As far-fetched as that sounds, he wasn’t the only one. The reality was that rehabilitation would involve finding just the right balance between leaving open the possibility of a return to racing and preserving Phinney’s ability to walk at least somewhat normally later in life. Suddenly, after years of being a professional athlete and defining himself by his elite physical capabilities, he was being defined by the fact that he couldn’t ride a bike. As he learned to sit back and let his body do its thing, he also had to find new ways to view himself. One thing Phinney discovered was an indefatigable need to express himself. Given his often flamboyant hair and outfits, this might seem obvious. But prior to the accident, Phinney’s main form of expression had always been his physical ability. Robbed of that, he started looking down other avenues for the first time in his life. That led him, initially, to flying lessons and art. “Everything we do as physical beings is an expression of who we are,” Phinney says. “Even the way I’m sitting now, with my legs crossed, and the way I move my hands, is an expression that’s just bursting out. Phinney’s painting style is a mash-up of abstractionism and the street-inspired expressionism of Jean-Michel Basquiat. It’s raw and unstudied, but, as when he first jumped on a bike, there is no denying the underlying talent. The self-indulgence actually serves him well. He’s naturally talented enough that he can follow his own instincts to some spectacular ends. In art, as well as in cycling, the process of following his instincts has become far more important than the ends. The finished painting does not matter as much as the act of painting. Returning to racing wasn’t nearly as important as trying to return to racing. No race is as important as the training. Winning isn’t as important as learning from the losses. While everyone agrees Phinney is more focused than ever, he has also found new ways to balance his needs for exploration with the demands of professional sports. That includes what he wears when he’s training. It’s common around Boulder to see Phinney out on rides wearing a denim jacket over his BMC jersey. 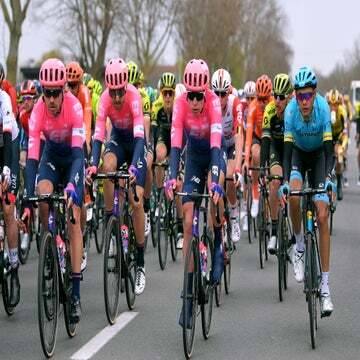 The need for connection and expression has also changed how and where Phinney trains. He spent the week before Thanksgiving training alone and self-supported from Los Angeles to Joshua Tree National Park, riding point to point and carrying his clothes in a handlebar bag. It’s an approach inspired, in part, by his participation in “Thereabouts II,” a ride — and subsequent documentary — in which Phinney and racer friends Lachlan and Gus Morton rode from Boulder to Moab, Utah, in an attempt to reconnect with the fun of cycling. “I love putting bags on my bike and ending up somewhere different than where I started,” Phinney says. “I’ve spent my whole career training from point A to point A. But you have this cool vehicle for transportation. The idea that we could go from point A to point B, and then from point B to point C — that’s why we invented bikes in the first place. Introducing that into training has been great. The flip side of that, for better or worse, is that Phinney prefers to be accountable mainly to himself. In truth, he has a tremendous stubborn streak. He admittedly struggles with sponsorship requirements and chafes even at things he enjoys if they become obligations. When he was a child, his father had to dial back his coaching of Phinney’s youth soccer team when Phinney made it clear that it was his team and his game and he was going to play it his way, regardless of what his father/coach wanted him to do. “From that point on, I backed off,” his father says. When I catch up with him in January, he’s in the middle of an open-ended stay at a house in the trendy Silver Lake neighborhood of Los Angeles, where he’s been preparing ahead of his return to Europe in mid-February. After two months of full-time training — he’s doing 25-hour weeks — he’s noticeably less talkative than he had been in November, when the comeback was still new. He points out that his races at the conclusion of last season weren’t the end of his rehab but just a step. In addition to his training load now, he’s still working with a physical therapist several times a week and doing his own daily work to deal with the pain and imbalances that remain. His hamstrings and IT band need constant work, and he says he’s still unable to run even short distances. So his riding-as-experiment mindset, while sincere, is also a great bulwark against letting the obligatory hours and days and weeks and months of training become a drudgery that drives him from the sport. While his coaches and bosses obviously have specific expectations, those work only as long as Phinney can find a way to set personal goals that align with them. His team wants him to win races; he wants to see how far he can push his body. It works out. So though he says his BMC bosses aren’t necessarily huge fans of his hippy-wanderings-as-base-miles approach, they tolerate it. And it’s not as if he spends these trips just riding between bars and parties. He follows a plan, turns in his data, and, because of his new mindset, trains harder than ever before. “He likes to party and have friends outside of the sport, which is how it should be,” says BMC team doctor Max Testa, who has known the Phinney family since the 1980s, when he was the team doctor for Davis Phinney’s 7-Eleven team. “But when it’s time to race or train, he’s very professional. With all the obvious caveats about small sample sizes, consider this: Phinney raced as a pro for three and a half years before his accident. Not including time trials, he racked up only seven podiums during that span. In just two months of racing after his return at the end of 2015, he notched three. Those included third place in his first race back, stage 1 of the Tour of Utah, and a chill-inducing, reach-for-the superlatives victory in stage 1 of the USA Pro Challenge. “It almost felt like I was playing an old video game and I put in cheat codes,” Phinney says of those rides. “I came in expecting nothing. I knew that I was strong, but I had nothing to gauge myself against. I came in and it was just like ‘boom, turbo,’ right away. I had this completely different mindset about how I was racing, where I was in the pack. If you think Phinney’s talk of valuing process over product and learning over winning is insincere, know this: He passed up a financial windfall just for the chance to race again, despite indications that he might have been unable to compete. Three days before his first race back at the Tour of Utah, Phinney was told by a specialist that he needed another operation on his knee — a procedure that would have required six more months of rehab. After discussing things with his parents and team doctors, he decided against it. But in addition to having not raced for 15 months, he now had new doubts about whether or not his knee could hold up. And here’s the thing: Phinney had a huge, set-for-life insurance policy that would have paid out if, after his injury, he hadn’t returned to racing. I know about the policy only as a rumor that had been going around Boulder. Not only is this something Phinney doesn’t advertise, he doesn’t even like talking about it. But he confirms that the policy existed and that, simply by clipping in at Utah — without knowing if he’d even be able to make it to the end of the first stage — he surrendered the payout. 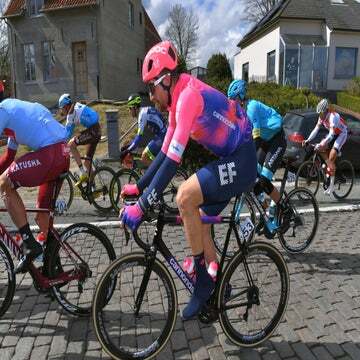 During the offseason, as he was planning for the year ahead, Phinney said the first real race he put on his schedule was Paris-Roubaix, leaving no doubt that, while his approach to racing may have changed, the races he wants to approach has not. So would a victory on the cobbles give him the career he wants? Or would failure ever to win in the Roubaix velodrome have him second-guessing himself? “I assume that the way that I think about what I do right now is only going to evolve as I get older,” Phinney says. “But I think that being happy with what you’ve been able to achieve in sport is all your own personal perception, because only you know if you really did as much as you could to connect the dots between your mind and your body to present yourself at a race and be as best as you could have been.